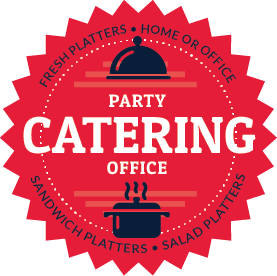 Our party platters will serve approximately 5-6 people. A big portion of thinly sliced deli fresh turkey, crisp bacon strips, American cheese, lettuce, tomato and mayo. Served on sub rolls. Sub rolls stacked with salami, ham, pepperoni, mozzarella cheese, lettuce, tomato, red onions, Italian dressing and mayo served hot. Chicken tenders, mozzarella sticks and fried pickles. A platter full of battered and fried chicken tenderloins served with honey mustard. Freshly mixed greens, black bean salsa, fresh corn and pico de gallo all tossed in our homemade balsamic dressing. Then topped with chicken, Cheddar Jack cheese and fried tortilla strips served with a cheese quesadilla. Fresh mixed greens with grated cheese, crisp bacon, crunchy croutons and diced tomatoes. Freshly grilled chicken served on the side for you to add with your choice of dressing. Romaine tossed in our Caesar dressing topped with Parmesan cheese and croutons. Mixed greens topped with diced tomatoes, eggs and bacon. Served with your choice of dressing. Grilled chicken breast served over mixed greens with candied roasted pecans, fresh blueberries, mandarin oranges, feta cheese, strawberries and raspberry walnut vinaigrette. Our premium tender, fall-off-the-bone barbecued ribs glazed with our delicious barbecue sauce. Cajun grilled shrimp, chicken, andouille sausage, roasted red peppers and onions served over fusilli pasta in a spicy Cajun cream sauce and then topped with grated Parmesan cheese. Hot, fresh and prepared every 30 minutes, our baked potatoes can’t be beat! Six potatoes served with butter, sour cream, Monterey Jack and Cheddar cheeses and bacon crumbles. Build your own masterpiece! Our baked beans are sure to please. Warm with a bit of spice. Add cheese and onions 1.89 extra. Made especially for kids, this tray is packed with their favorites! Grilled cheese, mini cheeseburgers and chicken tenders served with honey mustard.